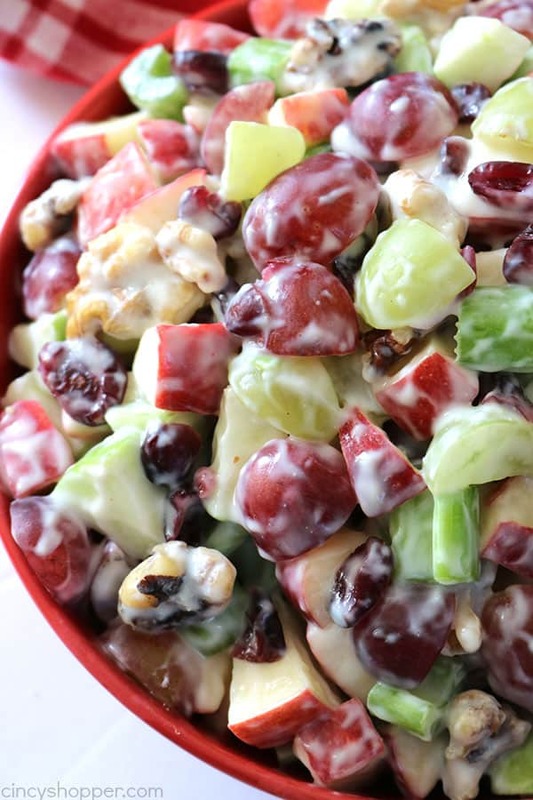 You will find this Waldorf Salad loaded with apples, grapes, celery, dried cranberries, walnuts, and vanilla yogurt. It will make for a perfect side dish for your Thanksgiving and Christmas dinners. 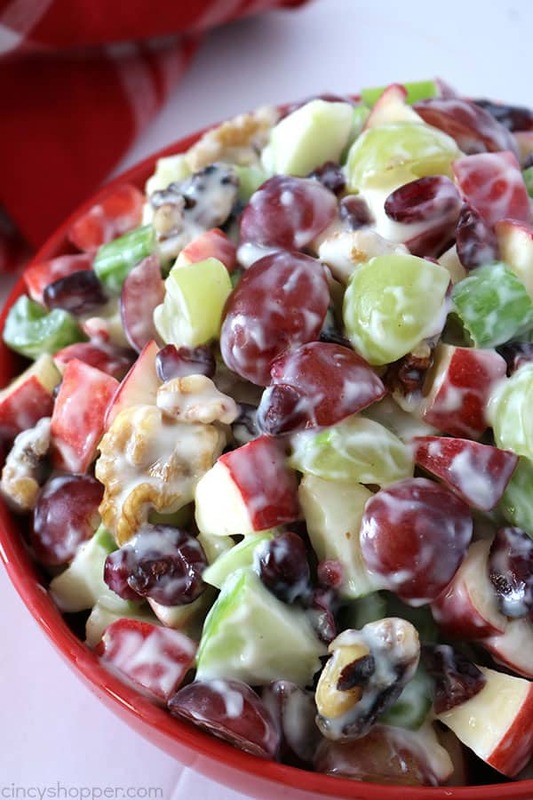 My grandmother makes a traditional Waldorf Salad every Thanksgiving and every Christmas. I was always hesitant to even give it a try because she included mayo in her recipe. I recall watching all the fruits being loaded into the bowl wishing the mayo was not going to be added next, lol. I was never a fan of mayonnaise. So I just never loaded the salad on my plate during the holidays. I LOVED all the other ingredients she tossed in that bowl but the mayo just killed it for me. I am making some new side dish recipes for the holidays this year. This week, I shared The Best Sweet Potato Casserole with you. Yesterday, I posted our Cheesy Green Bean Casserole. I know both those dishes are going to be great for Thanksgiving dinner. 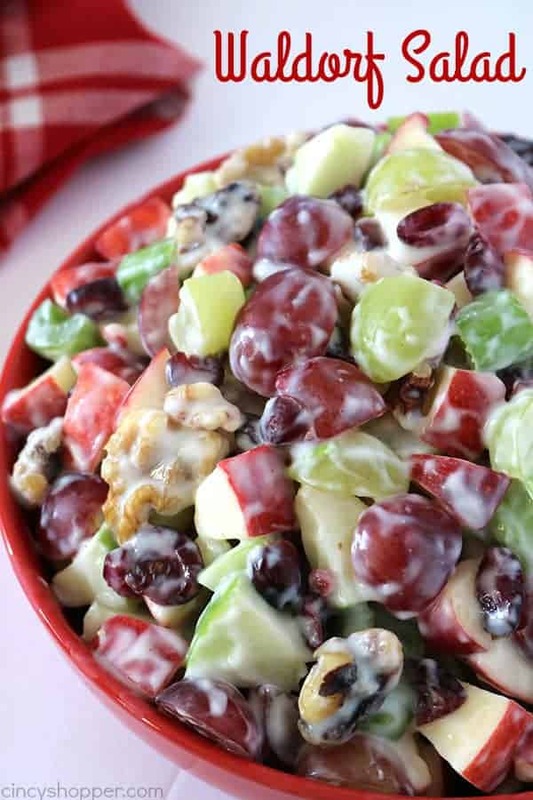 I was really wanting my kiddos to try Waldorf Salad like their great grandmother makes. Problem is… They do not like mayo either. So I decided we would make our own Waldorf Salad with vanilla yogurt instead of the mayo. The salad turned out absolutely delicious. The kids loved it and this mom ate two HUGE helpings. 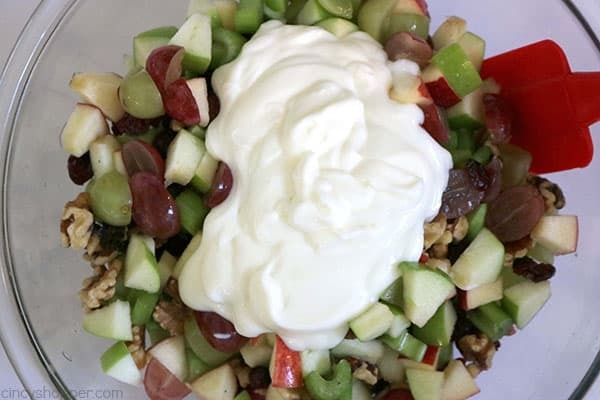 This recipe for Waldorf Salad is quite traditional with yogurt substituting for the mayo. This recipe is just like my grandmothers except no mayo. I know she would probably think I am crazy for not adding in mayo, ha ha. I am just happy to have a traditional salad with a bit of a twist. 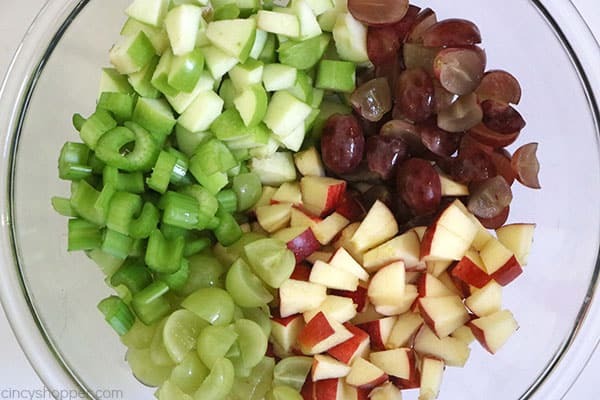 Add fresh fruits and celery to large bowl. I highly recommend adding this dish to your holiday dinners. You are going to love the crunch and creaminess that it offers. 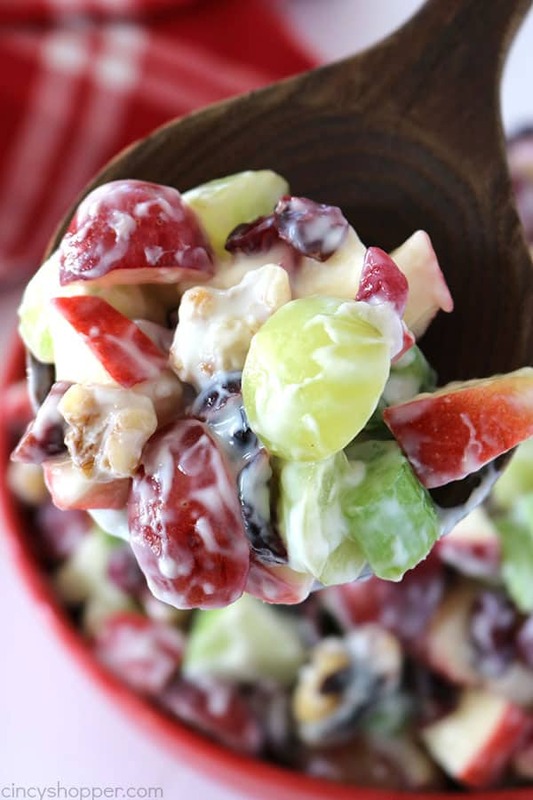 Creamy Grape Salad – Similar salad but a bit sweeter! 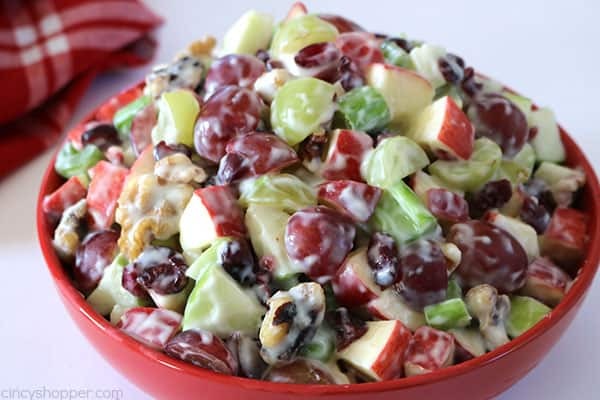 Creamy Fruit Salad – Loaded with all different types of fruit. Frog Eye Salad – This is a must make! This would be a wonderful salad for Thanksgiving.It’s so colorful and makes a beautiful presentation. 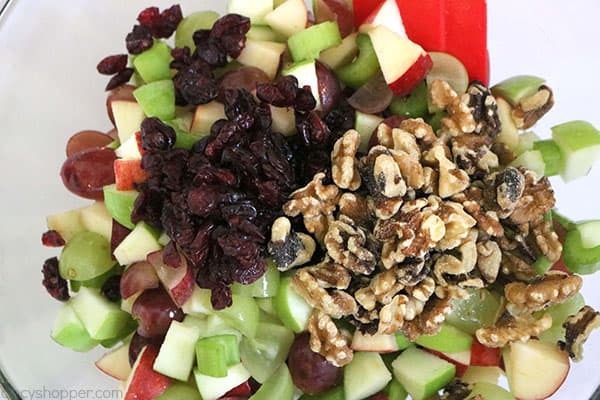 I think everyone loves Waldorf salad and I like your lighter version. This is the perfect recipe to bring to Thanksgiving dinner! Thanks for sharing it with us at Merry Monday this week! I saw your recipe and couldn’t resist. Just stirred it up for our family dinner tomorrow and sneaked a taste. This has wowed me! 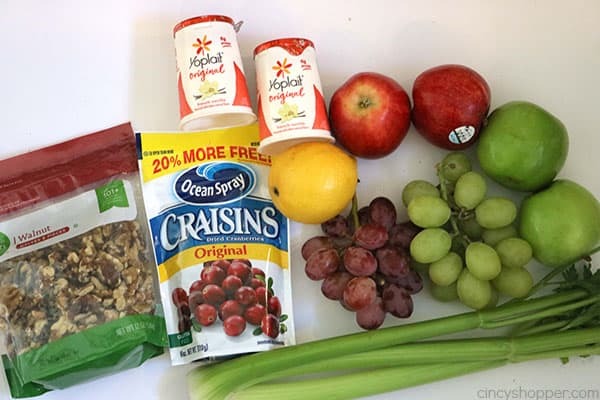 The yogurt and grapes are a wonderful addition. The only change I made was pecans instead of walnuts because that’s what I had wo thumbs up. If you are making this wonderful dish a day ahead of time; can you put the yogurt on one day again, or is it better to wait a few hours before severin. 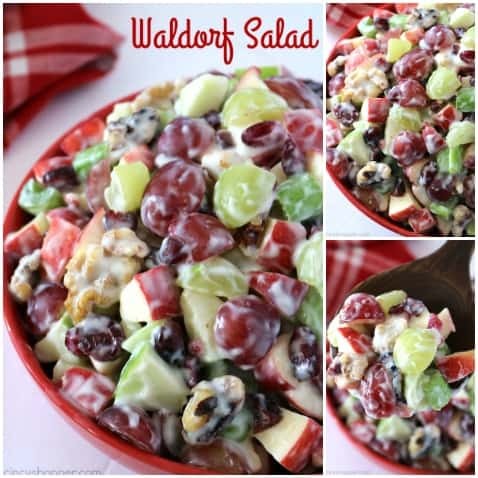 My mother always had Waldorf Salad every Thanksgiving and Christmas. She would use mayo too but one year she used some Cool Whip with a little dollop of sour cream.We loved it! She would always toast her nuts in the oven for added flavor and add a pinch of salt wether she used mayo or cool whip. We loved the salad either way! My mother added rotini or farfalle noodles to it. 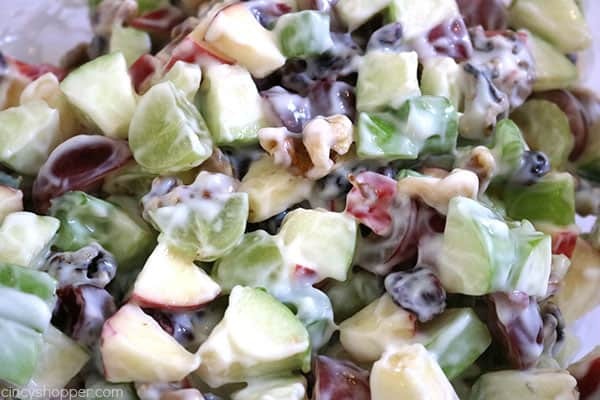 I really wanted to make a Waldorf Salad for Christmas dinner, but knew my daughter and son in law wouldn’t eat mayonnaise. I was thrilled to find your version with the vanilla yogurt. Everyone liked it and there were no leftovers. Thanks! This looks so yummy, but what would you recommend other than yogurt. I’m not a fan of yogurt! I made this today for my Herb Society meeting. I doubled it. It was fabulous! Everyone loved it…it was all gone. Thanks for the great recipe!